Oliver had more than one great friend on the beach. When Miss Mocha, a sweet baby goat, wandered on the beach, Oliver immediately took charge of helping care for her. He groomed her and cuddled with her when she was small. As she got older their friendship grew stronger and as many young ones do they got into a bit of trouble here and there. 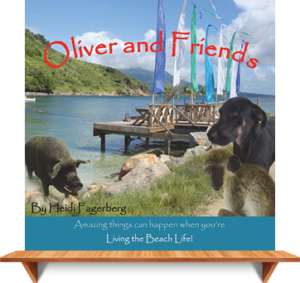 Find out what sorts of mischief a goat and a monkey can get into living the beach life. 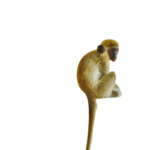 Oliver was a sweet sensitive young male vervet monkey, loving with kind eyes and gentle soul. Easily amused, Oliver was fascinated by all the things there are to do while living on a beach. Sneaky and quick to grab other people's belongings he was often frustrated when forced to return these things to their rightful owners. 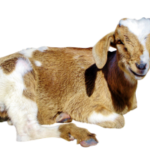 Miss Mocha was a gentle and playful goat, eager to cuddle and content to bathe in the sun on the beach. She let you know what she wanted with her loud goat bellows and she would prance quickly towards you to greet you, especially if you happened to be carrying some food. She was Oliver the Monkey’s close friend often allowing him to climb up on her back for a ride. 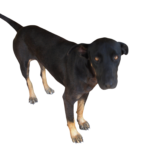 Lion Paw was a playful puppy with large black and brown paws. Every day she would go for at least one sea bath and a run across the bay. Very protective of friends, caretakers, and territory, she was well trained and knew just when to pounce and when to hold back and warn you with a bark. She loved sharing the beach she called home with Oliver the Monkey, Miss Mocha the Goat, and Wilbur the Pig. 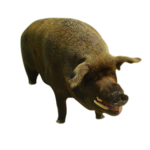 Wilbur, a big burly pig loved being around people, bathing in the sea, cooling down in the mud, and napping in the cool shade of a boat rack or a tree. His brown coat blended in with the mangrove trees along the beach. He often used the sound of the waves to find his way to the sea when he could no longer see. Being the eldest of the beach animals he spent a lot of time resting. You could often find him sprawled out on the sand snoring an afternoon away.